Google Penguin update is the most recent, major search engine algorithm update from Google to reward high quality websites. This major search engine algorithm update was rolled on from April 24, 2012 but no official word is given on when this will be rolled out in each country or whether it will be rolled out everywhere at the same time. Also, it is interesting to note that Google does not name it "Penguin update" in the official blog, but the name is mentioned only in the complaint form. According to the official definition of the Penguin update given at the Google Webmaster Central blog, this update is meant to "reduce webspam and promote high quality content". So, typically, after this update, we should see more high quality sites in the Google search results and spammy sites should go away or should be pushed down to the bottom of the search results. Let us get back to the discussion on How to recover from Google Penguin update. 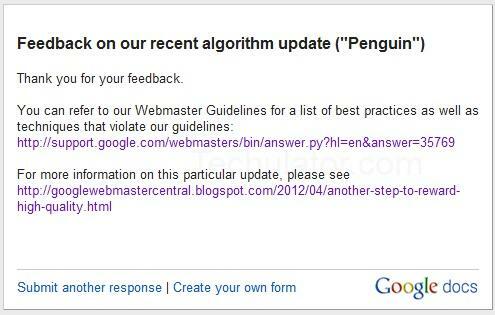 Looks like the Penguin update was not welcomed by the web community in the way Google expected. Due to the large number of complaints that genuine and original content was penalized by the Penguin algorithm update, Google has decided to open a complaint form to accept complaints from webmasters and bloggers. If you think your website should not have been affected by Penguin algorithm update rolled out on April 24th, just fill out the form with all details and evidence to prove your point. Specify your URL, the search query for which you expected your website to show up and the details. 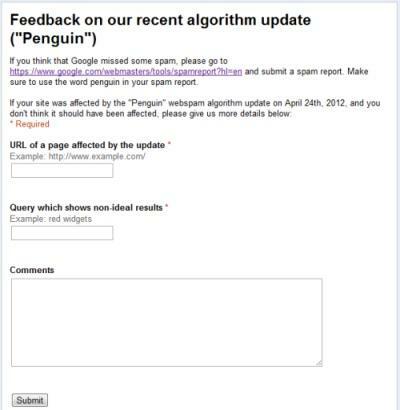 You may use the same feedback form to give any general feedback related to the Penguin update. It does not have to be a complaint related to traffic reduction but you may even use it to report a good feedback like significant improvement in your traffic after the algorithm change. There is no guarantee that Google will respond to you. Even if Google wouldn't analyse each case one by one, I am sure it will look in to the complaints and analyse their algorithm again based on the general feedbacks. Present your case well with good description in good English to get better attention. Nobody will bother to pay attention if you have not given all required details to study your case well. Make sure your website follow all Google webmaster guidelines before you proceed with a complaint. If Google chooses to do a manual review of your site to figure out why your site was affected by Google Penguin update, your site may land in to more trouble if it violates the webmaster guidelines. In the last few days, Google has rolled out many algorithm changes that affected hundreds or thousands of websites. If you look at the comments posted under the official Google Webmaster Central blogs, you can feel the heat of it. In fact, this site itself (Techulator.com) was also affected by some algorithm changes. Since April 7th this month, we have lost a very significant portion of our traffic. I am not sure which algorithm change was the cause of it. Since the Penguin update was announced only April 24th, 2012 and it may take a few days to see the real impact of it, I don't think our case is exactly the same. What I suspect in our case is, there were a large number of our articles reproduced by other bloggers and websites. We had to change our domain name from MyWindowsClub.com to Techulator.com in March 2012. Even though we had setup all redirects correctly according to the guidelines from Google to move content to new domain, Google failed to transfer the content authority our old domain had. So, Google considered our new site as copy cat and started ignoring us in the search results. All copy cats are now appearing in search results, reaping the fruits of my several years hard work. I am dealing with that issue now through DMCA notices and various other means, which I will share through another article soon.